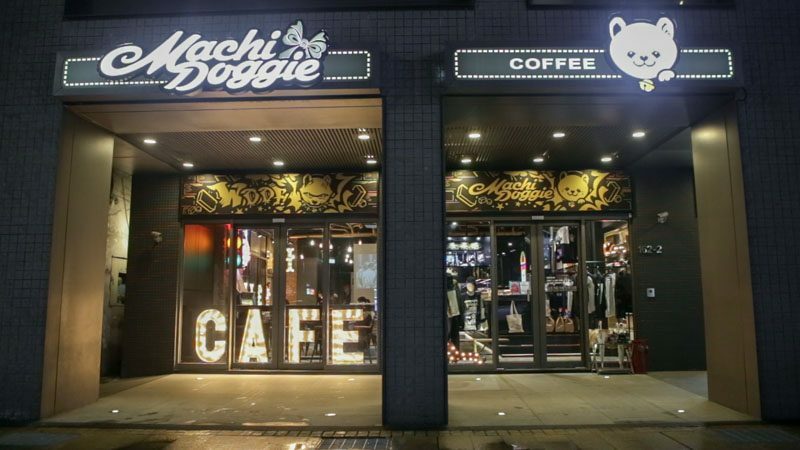 Conveniently located along the main road, just a stone’s throw away from Taipei city’s Ximending, sits Machi Doggie Fashion & Coffee. 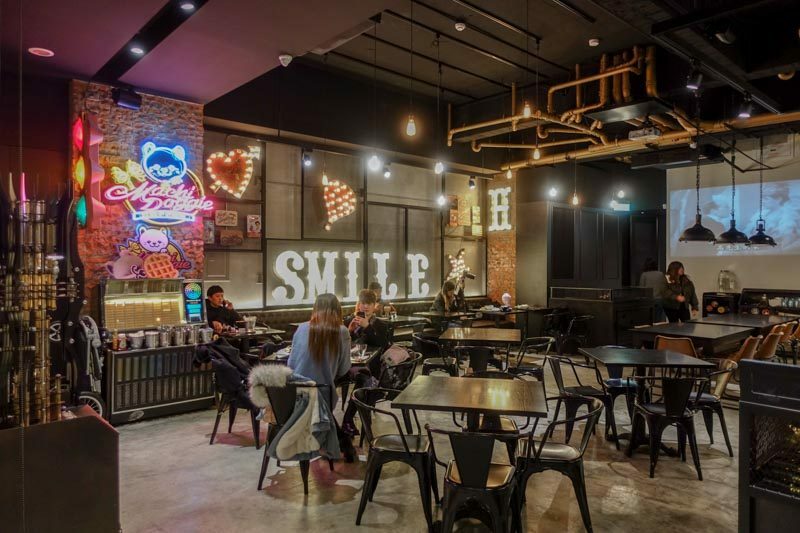 Owned by Taiwanese pop star Jay Chou and his wife, Hannah Quinlivan, the cafe’s cute dog mascot is inspired by Hannah’s pet Pomeranian, Machi. Being a huge (and I mean HUGE!) Jay Chou fan since my primary school days, it was only right that I paid this cafe a visit during my trip to Taiwan, and boy, I wasn’t disappointed at all! The cafe’s interior reminded me of an industrial-style American diner with its bright lighting details on the wall. A colourful neon sign in the shape of the cafe’s mascot hung above a vintage jukebox and there was also an interesting maze of bronze pipes that contrasted well with the cafe’s dark ceiling. The cafe also has a range of merchandise with Machi’s logo on it, as well as jackets and socks designed by the cafe’s superstar owners. Needless to say, I couldn’t leave without getting myself a cap and a pair of socks as a souvenir. Taipei in early February can get quite chilly, so we decided to order their signature Machi Marshmallow Coffee Latte (TWD$210, approx. S$9.45). I couldn’t help but squeal with delight when this was served to my table. 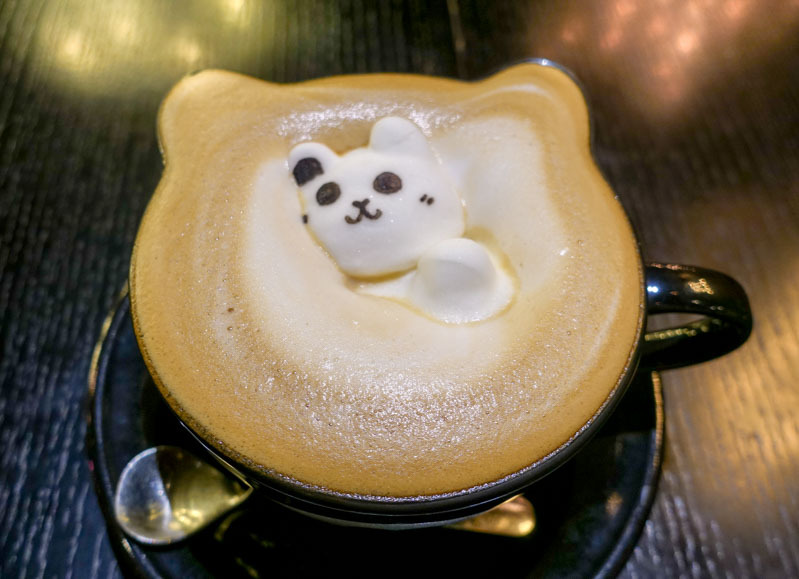 The coffee latte was served in an adorable Machi-shaped mug, topped off with a floating character marshmallow. This cup of joe exceeded my expectations with its rich, creamy coffee taste. I could tell the quality of the coffee from its robust flavours, and the marshmallow added a touch of milky sweetness when stirred into the drink. After noticing this range of cotton candy sodas on the menu, my dining partner insisted that we order one just for the fun of trying a gimmicky drink. We got the Butterfly Pea Juice with Lychee Cotton Candy Soda ( TWD160, approx. S$7.20) and it absolutely did not let us down. The soda itself had flecks of edible glitter swirling about in the elegant blue coloured soda. 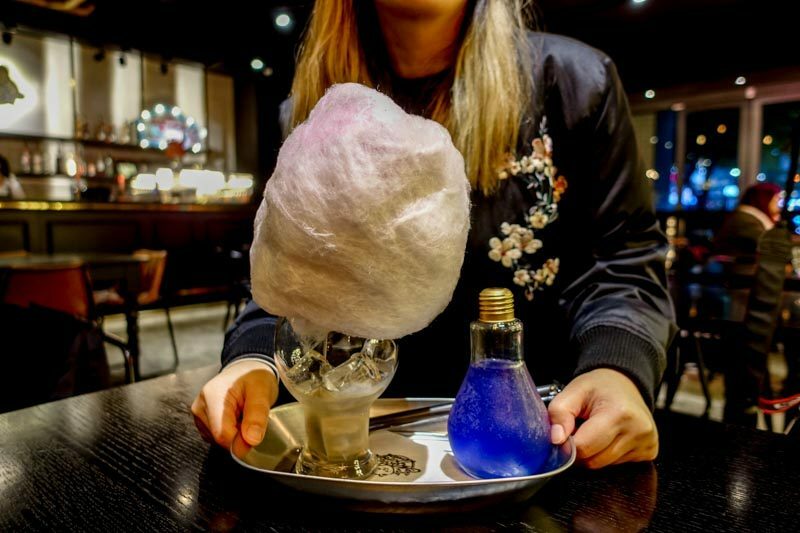 A huge cloud of cotton candy sat on top of the serving glass, which had lychee syrup at the bottom. We were supposed to pour the soda into the glass through the cotton candy, letting the candy melt into the drink. The end result was a drink that was refreshingly sweet and tart, looking just as mesmerising with its glittery glow. We were both glad that it wasn’t as sweet as we thought it was. The highlight of our visit was the adorably cute Waffle with Chicken served with french fries (TWD230, approx. S$10.37). 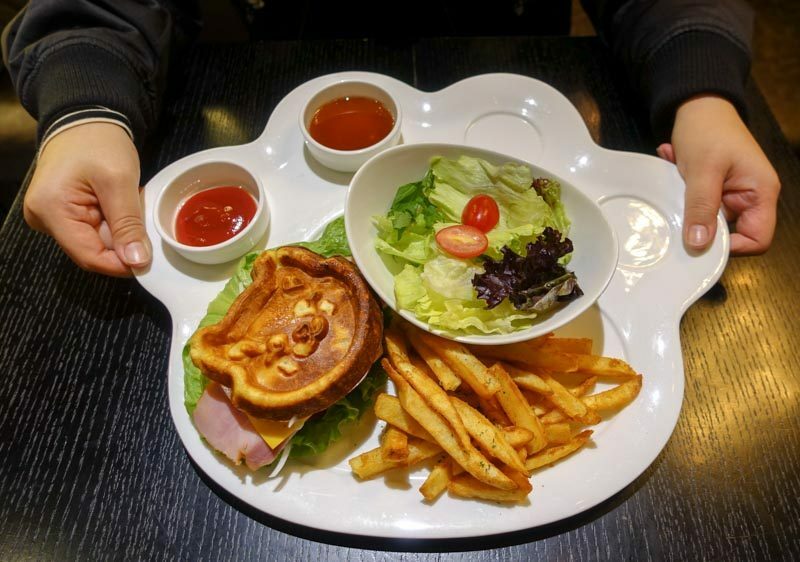 It featured sliced chicken ham, vegetables and cheese, sandwiched between two Machi-shaped waffles. My advice is to chow down on this while it’s still hot, as the waffles can get quite hard when it cools down. The sweet waffle complemented well with the savoury fillings, and the fries were still crunchy and flavourful even after we left them out for a bit. Machi Doggie Fashion & Coffee stood out as a memorable themed cafe with its chic cafe design and scrumptious food. With its convenient location, it’s a great place to pop by for a drink and a snack after a day of shopping at Ximending. While you’re here, try their popular Machi-shaped waffles and signature coffee drinks. The staff told us that Jay Chou and Hannah Quinlivan do drop by regularly to check up on the cafe, so don’t be surprised if you run into them while you’re dining there. We didn’t this time around, but who’s to say the next time we visit?